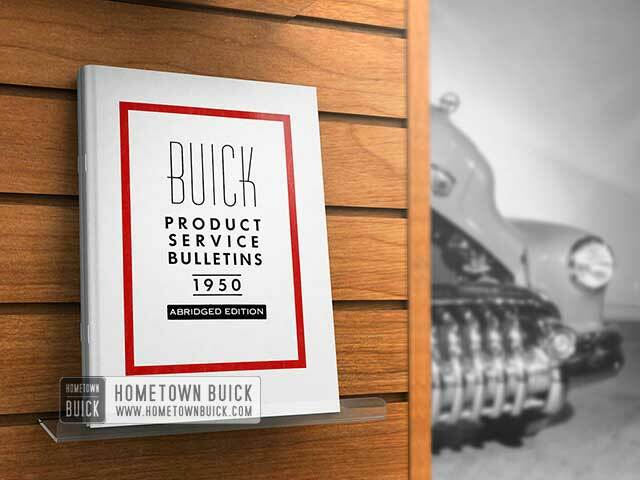 This section of the 1950 Buick Service Bulletins is about 1950 Buick Rear Axle Maintenance. Page 37 of the 1949 BPS Abridged Edition describes improved service differential gears available for 1940-41-42-H42 Series 40 and 50 cars. The Parts Department has now replaced the 1393200 gearset (4.454-1 ratio with case) with the 1393765 gearset which is also supplied as a replacement for the 1393198 (4A54-1 ratio less case) set. Installation of this improved gearset will also require the differential carrier reworking operation described in the abridged BPS reference. 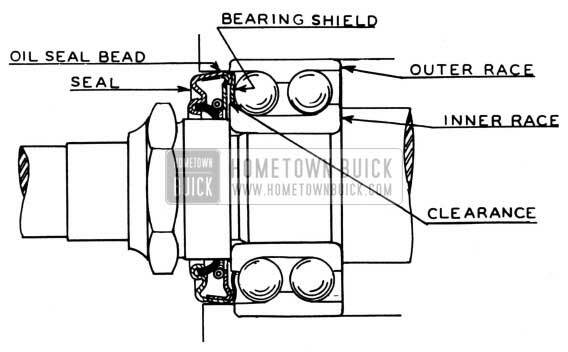 In the past we have devoted several articles to correction of oil seepage from the 1950 Buick rear axle into the torque tube or propeller shaft and, in the case of a defective or incorrectly installed spline seal, into the transmission. 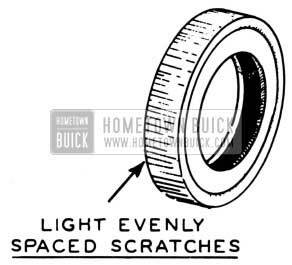 As pointed out, this condition may cause damage to the Dynaflow, reverse bind or chatter in the Dynaflow, roughness similar to that caused by propeller shaft “out-of -balance'” or premature 1950 Buick rear axle gear and bearing wear. In view of the possible serious consequences of this leakage condition the factory has made every effort to provide the field with up-to-the­ minute service information. 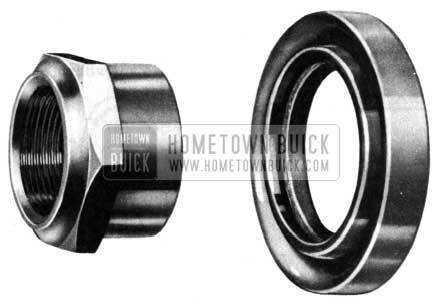 Buick Parts Warehouses now have available a new type pinion bearing seal and nut (see Figure 27) designed to positively control escapage of axle lube into the torque tube, when installed according to instructions. Remove the propeller shaft and pinion assembly. Check the shaft spline seal, for deformation caused by incorrect location, as outlined in the 1949 BPS Abridged Edition, page 33. Remove the propeller shaft from the pinion, marking the position of the shaft so that it may be reinstalled in the same position. Remove the production pinion bearing nut. Make a trial installation of the oil seal in the carrier bore, using a driver made up locally to specifications shown in Figure 28). The seal is placed on the end of the driver, secured by the screw and washer, and driven lightly into the carrier. Do not use excessive force. 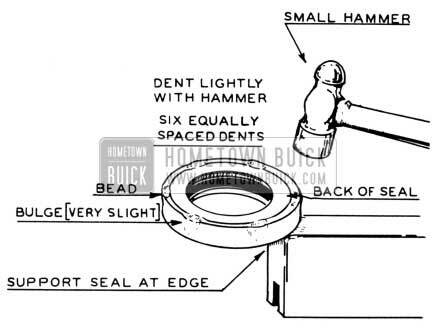 (a) If the seal will not start into the bore, remove a slight amount of the seal O.D. with emery cloth or by light filing. In this case, assembly may be made without special fitting. If the seal slips easily into the bore and shows no scratches, or widely spaced scratches, it must be fitted and sealed. This fitting is accomplished by denting the bead on the rear face of the seal in six locations (Figure 30), bulging the outer retainer sufficiently to increase the diameter .005″. Make another trial installation of the seal, making sure that the seal seats snugly in the bore. When removed the seal O.D. should bear scratches as indicated in Figure 32. When satisfied that the seal fit is correct, install the seal and nut as shown in Figure 33, tighten the nut to specified torque and stake in place. NOTE: The lip edge of the seal should be installed toward the tooth end of the pinion. Check the condition of the propeller shaft. If the shaft contains traces of oil wash with solvent and drain dry. NOTE: Oil in the shaft may cause unbalance as outlined on page 35, 1949 Abridged BPS. Reassemble the prop shaft and pinion, in same position as removed, and install a new spline seal, following the instructions given on page33 of the 1949 Abridged BPS. Reinstall the pinion and prop shaft into the axle in the same manner as production. CAUTION: Carefully work the pinion bearing shims over the O.D. of the oil seal to prevent deformation of the shims. The oil seal will be pushed into correct position in the carrier bore by the shield on the front pinion bearing. (Alternate Step for Step 9) If the oil seal was fitted to the bore by the method described in Step No. 5 (c) it will be necessary to provide a seal between the O.D. of the pinion oil seal and the carrier bore. A light coat of sealer, such as Permatex No. 2 must be applied to the O.D. of the seal and allowed to dry to a gummy consistency (at least 30 minutes) before assembly into the carrier. When this method is used, pinion shims must be selected before application of the sealing compound because they will scrape the sealer from the oil seal O.D. if installed later. Also avoid use of excess sealer since it may get into the shims and affect correct pinion location. The new oil seal is designed so that pinion shimming may be checked, and the propeller shaft and pinion assembly installed or removed in the usual manner.